Do a search about sleep and science, and you’re bound to run into the term “circadian rhythm.” The concept is fundamental to understanding our body’s daytime and nighttime behavior. In this article, we’ll dive into how circadian rhythms work, and why they’re so important for sleep. Let’s start with a definition: circadian rhythms, like many scientific terms, take their name from the Latin for day (“diem”) and around (“circa”). As these word-roots imply, “circadian rhythm” serves as a catch-all term for the set of internal processes that take place in cycles. For humans, each cycle covers a period of roughly 24 hours. What does it mean to have a “biological clock”? The term makes it sound like our organs and internal systems all march in lockstep to an omnipresent timer, but that’s not quite the case. 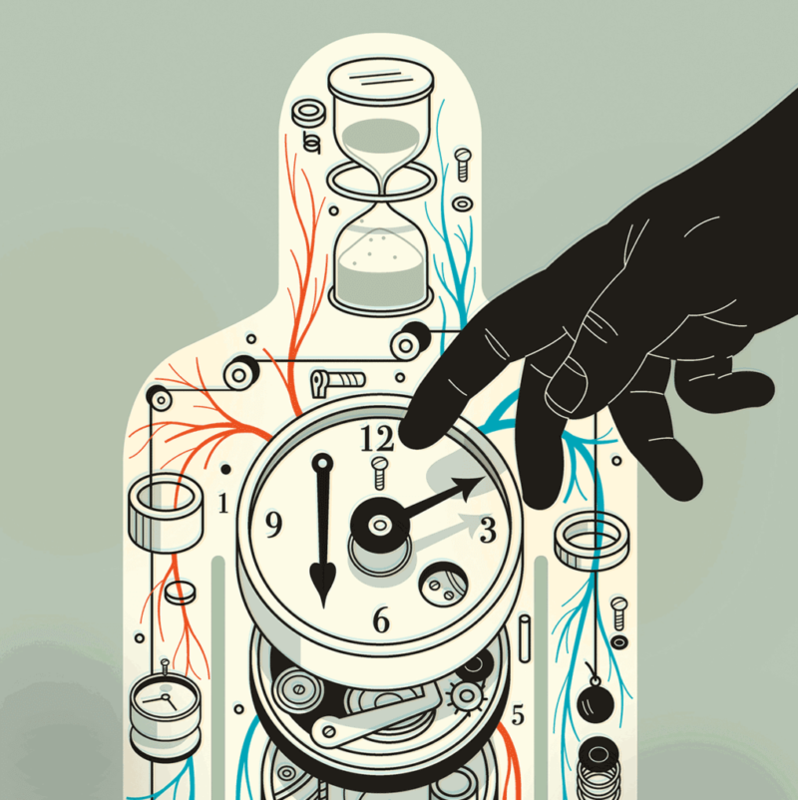 For our bodies, “clocks” come in the form of precise biochemical interactions. These cellular-level processes serve as the gears that drive our circadian rhythms. Let’s zoom in on our body’s cells for a minute. Within each cell, imagine a clock. Since the clock is small (enough to fit in a single cell! ), we’ll call it a molecular clock. This clock consists of several switches in the form of specific genes. When flipped on, a gene produces proteins that prompt the cellular clock to move from one state to the other. 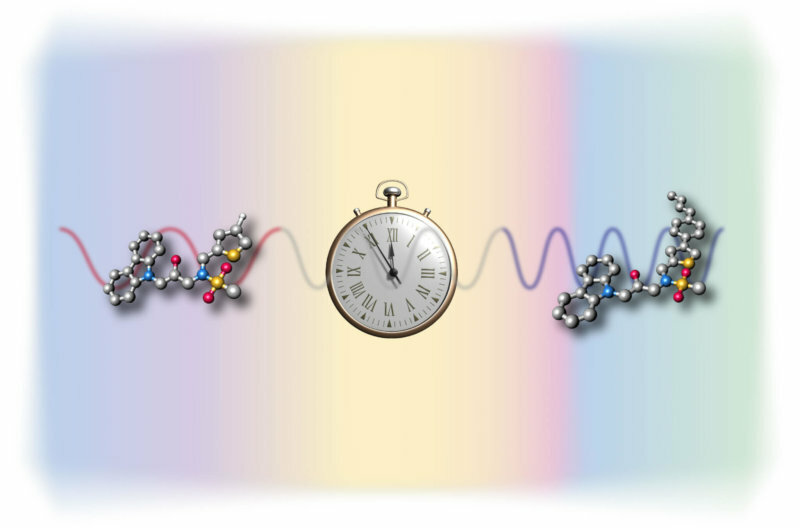 Scientists have managed to pinpoint several genes involved in our cells’ molecular clocks. In keeping with their functions, these genes have been given names like period (shortened to per); timeless (tim); clock (clk); and cycle (cyc). Per and tim were two of the first to have been observed in organisms like fruit flies, mice—and by 1997-1998, humans. Later, clock and cycle were also identified in different species, including humans. To better illustrate how these genes work, let’s zero in on these four and walk through a simplified version of how they interact. Starting around midday, the per and tim genes are switched on. When this happens, they begin producing separate proteins: PER and TIM proteins, respectively. These genes’ activity—and therefore, the production of PER and TIM proteins—continues throughout the afternoon. Around dusk, the concentrations of PER and TIM proteins in the cell get so high that they basically can’t avoid each other anymore. At this point, the PER and TIM proteins start merging or binding to form PER/TIM complexes. The formation of these complexes also signals the per and tim genes to wind down. The PER/TIM complexes persist over the course of the night. At dawn, when the organism (that’s us!) is exposed to light, the body takes that as a signal to start breaking down the PER/TIM complexes. This dissolution continues until midday, by which time all the PER/TIM proteins are gone. Then the per and tim genes get switched on again, and the cycle restarts. Wait. What Activates the Per and Tim Genes? That’s where the clk and cyq genes come in. The clk gene produces a protein called CLOCK. When there are no more PER/TIM proteins present inside a cell, the CLOCK protein is free to interact with the per and tim genes. This interaction, researchers found, is what switches these genes on. The cyc gene works in a similar way, triggering per and tim gene activity. When the PER/TIM complexes form at dusk, they block the CLOCK and CYCLE proteins. This is how the per and tim genes know that they should start winding down: there are no longer any proteins keeping them flipped on. When it comes to the molecular clock, then, these proteins also serve as a regulating device for each gene: when protein concentrations reach a certain level, they also prompt the related gene to stop or start production. Essentially, each gene has a self-made feedback loop that automatically switches it on and off. Now, these clock genes don’t just interact amongst themselves. The proteins they produce also trigger other genes within a cell, turning on different “gene switches” that are related to processes like hormone production, temperature regulation, and so on. That’s how these cellular-level rhythms carry over to higher-order systems within our body. Remember how the PER/TIM protein complexes start breaking down when our bodies get exposed to light? Our cells detect that exposure thanks to receptors in our eyes. Those receptors then secrete chemicals that alert specific clusters of nerve cells in our brains. These clusters form the suprachiasmatic nucleus or SCN. The SCN serves as our body’s “master clock,” and it’s responsible for synchronizing all the tiny molecular clocks ticking away in our body’s different cells. Think of each process in your circadian rhythm as an instrument, and the SCN as the conductor. Your sleep/wake cycle is one of the instruments in our body’s 24-hour symphony. Around evening, the SCN stimulates the pineal gland. This gland secretes melatonin, which instructs the body to lower its core temperature and promotes the onset of sleep. How Does Your Environment Affect Your Circadian Rhythms? By nature, circadian rhythms are self-sustaining. In fact, in the 1960s, researchers at the Max Planck Institute for Behavior Physiology found that people’s circadian rhythms continued ticking along 24-hour cycles even in the absence of light. This doesn’t mean our circadian rhythms are completely insulated from external factors. Our environment provides important cues that help keep our circadian rhythms tuned to their regular 24-hour cycles. Scientists like to call these factors zeitgebers, from the German words for “time” (zeit) and “giver” (geber). One of the most important cues? Sunlight, or more broadly, lighting. Remember how our body starts breaking down PER/TIM proteins at dawn? Exposure to natural light in the morning resets our biological clocks. Thanks to this process, our internal clocks stay in step with the day and night cycles of a standard day. But sunlight is no longer our only source of light. With the proliferation of artificial lighting, from lightbulbs to our backlit device screens, our exposure to light no longer conforms to the usual daytime and nighttime periods. We could have all our lights on at 10 PM, for example, causing our bodies to think that it isn’t time to sleep yet. This is partly why our habits, especially the ones that constitute what we call “sleep hygiene,” also affect our circadian rhythms. How we structure our day can determine when we’re exposed to light. Scrolling through our phones late into the night, for example, keeps important receptors in our eyes stimulated—feeding the chain of biochemical reactions and switches that keep our internal clocks from winding down. It’s not just about light, though. Other habits can introduce stimuli or substances that can disrupt our normal circadian rhythms. Regularly drinking coffee or tea late in the day, for example, introduces caffeine into our bodies, possibly keeping us alert and awake for longer than usual. Aside from these major external factors, our body also listens to other cues like ambient temperature or the timing of our meals. The influence of these environmental factors on our circadian rhythms explains why we remain susceptible to conditions like jet lag or sleep cycle disorders despite our self-sustaining internal clocks. Why Should We Care About Circadian Rhythms? For us in the Good Night’s Rest community, circadian rhythms are essential to understanding sleep. These rhythms don’t just affect the timing, duration, and quality of our sleeping hours. Aside from their direct involvement in our sleep/wake cycle, circadian processes also influence systems like our metabolism, blood pressure, body temperature, and others that can further influence how we sleep. To quote from the University of Leicester’s Dr. Charalambos Kyriacou, a molecular geneticist who studies biological processes, “There isn’t any aspect of biology that circadian rhythms aren’t important for. They are totally fundamental in a way that we didn’t anticipate.” In fact, long-term disruptions in our circadian rhythms have been shown to play a hand in the development of illnesses such as Parkinson’s disease. Aside from our bodily health, circadian rhythms also manifest in personal activity patterns and inclinations that influence our day-to-day productivity. These patterns are called chronotypes, and each of us falls along a spectrum of “types.” Where we stand on the chronotype spectrum can, in turn, tell us a lot about how to optimize our schedules to work best with our body’s internal timing. To learn more about working with your chronotype, check out our list of tips!